It is notoriously difficult to manually re-type lists of names into individual sets of artwork. 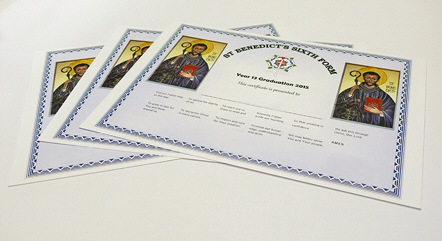 Using the latest HP Indigo digital printing press we were able to produce a batch of premium quality, high resolution, full colour certificates for our client. Each certificate was individually named on the fly from a data set supplied by our client. In this way errors were minimised and the recipients had a lasting memento of their achievements.